Two complementary powerful images from this week to reflect on. On Tuesday I took the train to Penrith – two trains there, and four trains back actually – to see some rocks. But not just any old rocks. Oh no. 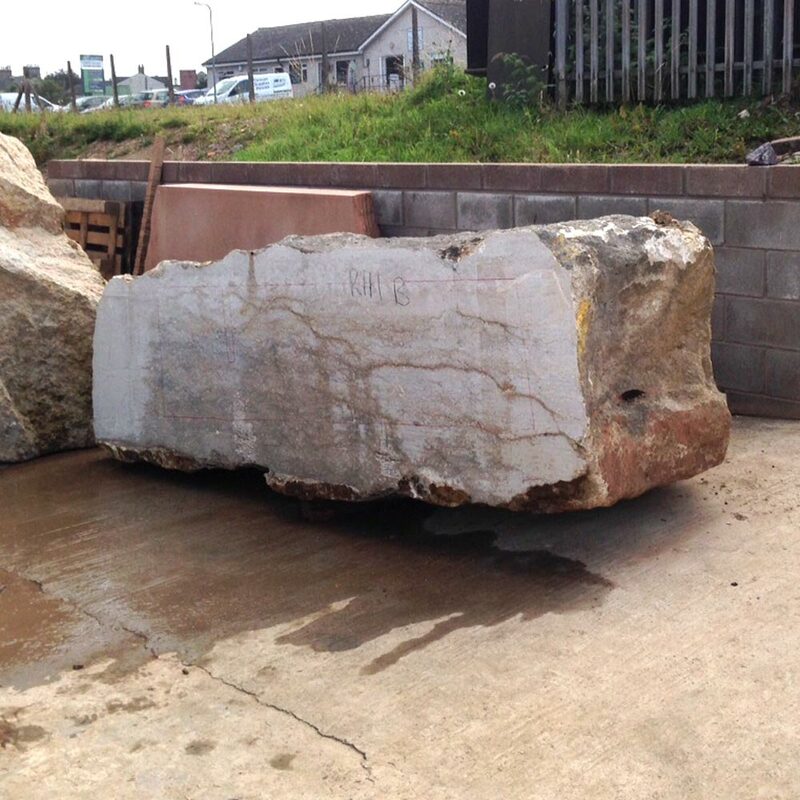 These were the three blocks of Swaledale fossil stone, quarried from North Yorkshire, and delivered to Cumbria Stone Works by our supplier for initial cutting and inspection. So that Josh (our architect), James (our stone mason) and I could choose the one we felt was best suited to be the block from which Richard III’s tombstone is to be made. And choose we did – but how??? It’s a bit complicated for us us stone-mason laity, but think of all the million-year old fossils that were once swimming around in a lake near the equator, dying and lying orientated in a line by a long-vanished river current. One of things we were looking for was a piece of stone which would enable us to have those fossils swimming along the tombstone, not across it. You can see it in the title picture to this article: it’s the one on the right. If you look could really close-up to the cut face, you could see those multi-million-year old trilobites swimming across. By way of contrast, here’s a picture with us all standing by it, in the Cumbrian sunshine. And what about the rivers? Do you remember the Biblical verse that runs down the length of the channel on our Cathedral Gardens water feature? “The river of the water of life, flowing from the throne of God…” (Revelation 22v1) – which goes on to complete “..down the middle of the great street of the city”. Powerful imagery for Leicester. Well on a more mundane level, on Friday we received handover of the mechanisms that keep that water flowing safely and cleanly, thus avoiding any unseemly contemporary law-suits from disgruntled citizens who may have decided to drink it rather than paddle in it or look at it! And then this Sunday morning David and I baptised 6 children in the font inside the Cathedral – a font that in the longer-term reordering may well end up just the other side of the wall from that external water feature, speaking of the River of the Water of Life. So we welcomed into the Christian family Amara Onyinyechi, Cherish Urenna, Ethan Sunil, Kian Donald, Etta Mae Jodie and Sophie Elizabeth. And in Ethan’s case the symbolism of dying and rising again was especially powerful, as I baptised him by total immersion – under the water and out again. A rock formed of long-dead creatures, that will form a tomb bearing witness to the hope of eternal resurrection. A river of life, in which new children of God were plunged, emerging blinking into the new life of Christ. Rivers and stones. The week – that’s what my life has been made of.